Louis Andriessen | Will You Miss Me When I'm Gone? Ugh. It’s pretty grim to realize it’s only Tuesday. And what a nasty Tuesday it has turned out to be. But there’s something happening tonight that’ll put a drink in your hand, a smile on your face and send you back out into the world with a head full of music: Pop-Up Concerts at Columbia University’s Miller Theatre. And it won’t cost you a dime. Here’s the deal: One Tuesday a month, this very cool program takes over the theater for a quick, casual get-together that ends in a very cool concert. Doors open at 5:30 p.m. Grab a free drink (thanks to Harlem Brewing Co.) when you get there, and hang out with fellow music lovers until the show starts at 6. Tonight’s program is Minimalism’s Evolution. Sure, it sounds a little heady, maybe even academic. This is happening on an Ivy League campus, after all. But this series isn’t like any college course you might remember. Pop-Up Concerts let you get up close and personal with the artists in an informal performance that lasts just an hour. 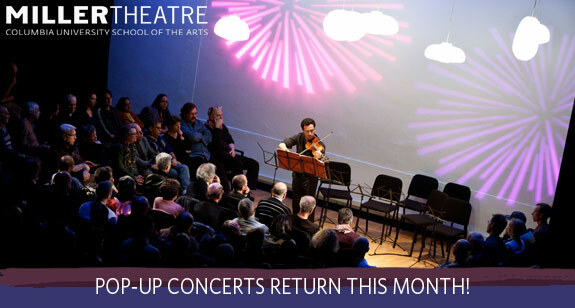 Be sure to save the dates of the next two installments of Pop-Up Concerts: Nov. 13 of 120 Years of Solo Piano and Dec. 11 for John Zorn for Strings. Tonight you’ll get three members of the awesome Ensemble Signal: Courtney Orlando on violin, Lauren Radnofsky on cello and Paul Coleman on sound.